Snowflakes are beautiful decorations on Christmas Day. Why not make your own? Rowse Honey had a lovely site with a bee snowflake design (see picture above). However, the design has vanished. I’m asking Rowse to send me a copy if they still have them. Let’s see! 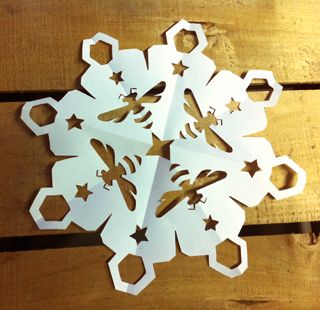 Hi, the PDF for this bee snowflake does not appear to be available any longer. Does someone have one that they could email to me? Thank you! P.S. I have already contacted the site, but did not receive a response! I’d really like the template for the paper snowflake with bee designs.